"40th Anniversary International Conference for Attitudinal Healing"
If Attitudinal Healing has touched your life or the life of someone you love in a meaningful way, please stand with us. We need your partnership and your generous financial support. Every donation is deeply appreciated, and there are numerous ways to donate. 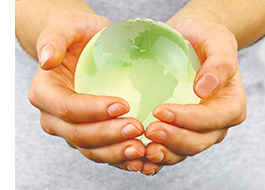 Come visit our Donation page and look at the many possibilities that can truly make a difference! 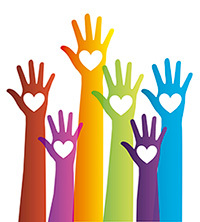 79.4% of all donations go to Direct Program Services. Share in the joy of the events and experience a deep connection with everyone in the worldwide AH Community! Whether you were able to be with us in person or not, we invite you to click here to view the conference photo galleries as well as video excerpts. "There is no one better qualified than Don Joseph Goewey to offer you a solution to stress that paves the way to a powerful brain to lift your life even higher than where you currently stand." More than 300 enthusiastic participants from around the world gathered September 16th - 21st at the historic Presidio in San Francisco to celebrate 40 years of service through Attitudinal Healing (AH). Thanks to the extraordinary contributions of presenters, sponsors, volunteers and participants, the International Conference was successful beyond our wildest dreams. The thirty plus conference speakers, drawing from a vast array of disciplines, inspired personal transformation, growth, and collaboration. New Centers and Groups for Attitudinal Healing are forming as a result of this life-changing conference. Each one of us plays a vital role as we move forward into the future of Attitudinal Healing. Thank you for your continuing partnership on this remarkable journey. 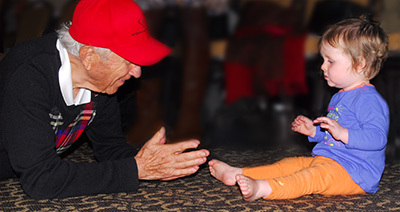 Jerry Jampolsky and Gracie Michalka, oldest and youngest members of the AH community, conferring on the future. Gracie is the granddaughter of the Founders of CAH - Perth, Australia (Donatus and Patricia Michalka), and the daughter of the Centre's current Co-Directors (Meneesha and Patrick Michalka). Launching the 40th year of Attitudinal Healing empowers our expansion, personal growth and service within our communities and around the world. Today, we stand on the shoulders of countless teachers of inner peace — individuals who have taken Attitudinal Healing into their hearts and into their lives and have changed our world for the better. Many of these teachers have moved on from this earth but have left a legacy of love and wisdom. Many are still with us, guiding our footsteps and strengthening our inner resolve. It is with deepest gratitude to all of our teachers and partners that we move forward with our vision for the future of AHI. Expanding our capacity to respond to requests for start-up support and Facilitator Training by engaging a team of Senior Trainers to support specific regions of the world. Fostering communication among existing and emerging Centers by establishing Sister-Center and Regional Network programs. Developing in collaboration with interested individuals and Centers a broad range of online, culturally adaptable AH trainings and workshops. Establishing the Online Resource Center to provide a communication portal for Centers to house multi-language curricula. Continuing to work with Centers from diverse cultures to facilitate expanding and adapting their youth and adult programs for use by other Centers. Broadening the availability of the Power to Choose curriculum to Centers and other agencies by publishing manuals for trainers, guidelines for teachers, and pre and post standardized test measures. Developing a robust sustainability plan to ensure the continuation of AHI as a support system to the AH Community for many years to come. Attitudinal Healing International welcomes your thoughts and ideas and is deeply grateful for your participation as we energize this living vision and explore how AHI can further best serve the global Attitudinal Healing Community. 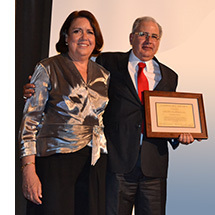 In 1992 the Fetzer Institute created the Jampolsky Awards to acknowledge and advance exemplary projects in the field of Attitudinal Healing, to honor the work and life of Gerald G. Jampolsky, M.D. and to enhance the potential for transformation through love, forgiveness and service around the world. At the 40th Anniversary Celebration event, through the generosity of Fetzer Institute and additional funding from AHI, the following Centers received a Jampolsky Award of $4,000 each for their exemplary Attitudinal Healing programs. The following award recipients will use the funds for the continuation, enhancement and expansion of their programs. The Good Neighbor Program is an AHC-Oakland innovation of AH consisting of two projects designed to uplift the lives of low-income individuals: The Neighborhood Orientation Workshop (NOW) and The Neighborhood Leadership Institute (NLI). 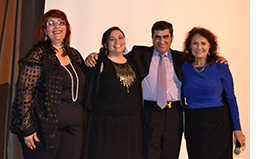 During the event an additional donor, Mr. Sean Tabatabai, stepped forward with a generous matching contribution for one additional Jampolsky Award of $4,000. With Mr. Tabatabai's offering, this additional award was presented to an emerging Center in Santo Domingo, Dominican Republic. The Power to Choose programs are unique Attitudinal Healing International innovations translated and adapted by independent Centers in culturally appropriate ways. Founded on the philosophy and Principles of Attitudinal Healing, the Power to Choose program aims to tap into the inner potential of underserved children and youth, empowering them to make healthy choices that positively impact them, their schools, families and communities. 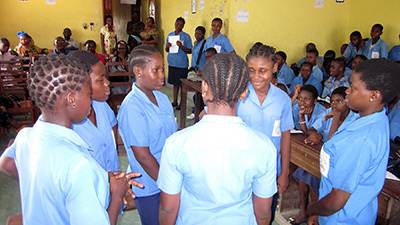 Abdou Tasha, Founder of CAH-Cameroon, uses a cascading model where youth ages 13-17 have the opportunity to grow and develop facilitator skills within the Power to Choose program where they can move from participant to collaborator, and ultimately program leader. The influence of the Power to Choose went well beyond the participants this year as they confronted the issue of bullying by establishing dialogues with the school administration to develop and implement policies that protect all the students. “This program has given me the tools to tackle all my worries and problems. It has helped me to develop a leadership spirit that is the spirit of always wanting to bring solutions, not problems to people issues. It has also encouraged me to make better decisions and choices and helped me in uncountable ways. All I can say is thank you to the organizers as well as the participants. “When I came the first day to the Power to Choose program, I was very shy and didn't think about the feelings of others. But as I continued coming for the workshop, I felt like something left me giving room to real happiness. I started giving more time to the feeling of other people, something I was never doing before. Today, to see that people really love me bring tears to my eyes and I am so grateful. At the invitation of the AH Centers of China, two AHI Senior Trainers (Carolyn Smith and Trish Ellis) and two volunteers (Joe Keery and Lynne Law) are currently travelling in beautiful Hangzhou and offering two AH Trainings: a three-day Introduction to AH workshop and a three-day Facilitator Training. Attitudinal Healing was first introduced in China at the request of Elsa Chen and James Hu in 2012. 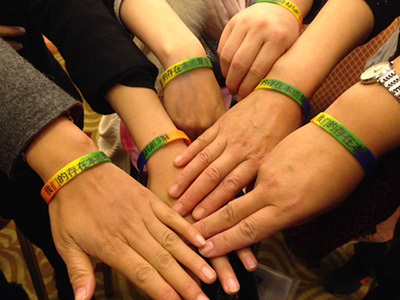 Following a 10-Session online Introduction to AH Course, Elsa and her friends hosted AH workshops in Beijing and Shangai in 2013. Today, AH Support Groups are offered in ten Chinese cities (Hangzhou, Xuchang, Beijing, Tianjin, Chengdu, Shanghai, Hengshui, Baoji, Harbin, Suzhou) plus two groups that meet on-line. Liu Xiang, an AH Facilitator in Hangzhou, is coordinating the Hangzhou trainings which are being held at the Lingyin Hotel, near the historic Lingyin Temple. More than one hundred potential facilitators are attending the trainings each weekend. “The Community Service Learning (CSL) Program, a unit within the Institute for Civic and Community Engagement (ICCE), recognizes and honors one community partner each year for contributing to the institutionalization of community service learning (CSL) at San Francisco State. 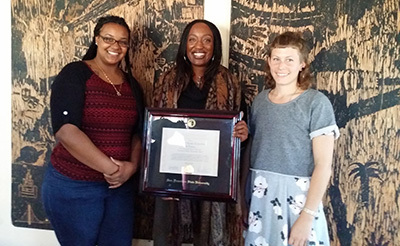 The CSL program is proud to announce Attitudinal Healing Connection (AHC) and ArtEsteem from Oakland, CA as this year’s recipient of the Community Partner Recognition Award. For close to 20 years the AHC/ArtEsteem art and literacy program has helped develop creative, engaged and successful children/youth through building knowledge and emotional, social, academic and intellectual skills. The program has reached 50,000+ youth and adults, and provided programs to approximately 57 schools in Oakland and the larger East Bay. 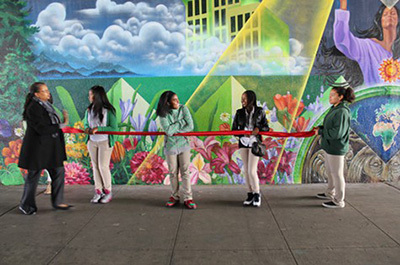 Most recently, AHC/ArtEsteem, through the Oakland Super Heroes Mural Project (OSH), unveiled the 2nd mural of West Oakland/Emeryville’s largest mural revitalization and beautification efforts. This project to date has engaged over 200 youth as agents of change in their communities, created over 80 jobs, enhanced the neighborhood, and reduced blight. AHI is delighted to welcome the New England CAH which officially opened on November 1, 2014 in Nottingham, New Hampshire. The Center’s co-founder, Judith Matthews is a child and family psychotherapist and long-time practitioner of Attitudinal Healing. In 1991, Judy and Suzanne Bowman (now deceased) facilitated a grief and bereavement group and developed a program called Bridges for parents and children facing life-threatening illness. The New England Center will offer study groups using Dr. Jampolsky’s books, bereavement and caregivers Support Groups, compassionate communication trainings and individual counseling with licensed therapists. For more information, you may contact the New England Center via email at [email protected] or by phone at 603 433-3058. 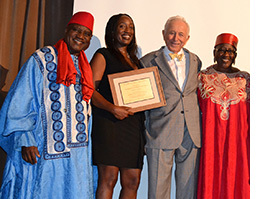 AHI and the entire International AH Community congratulate the Attitudinal Healing Connection (AHC) on 25 years of dedication and commitment to Oakland, to the greater Bay Area and to Attitudinal Healing worldwide. The mission of AHC is to empower individuals to be self-aware and inspired through the arts, creativity, and education, making positive choices to break the cycle of violence for themselves and their communities. To fulfill this mission AHC has created powerful and award-winning engagement programs and projects and transformed the lives of thousands of Oakland residents, both youth and adults. With direct hands-on creative and integrated community programs such as ArtEsteem, AHC has developed student literacy, leadership, and artistic skill in more than 67 Oakland public schools. 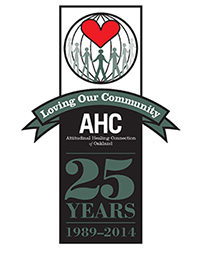 On November 15, 2014, the "Loving Our Community" Gala celebrated AHC’s 25 years of dedicated and positive community engagement and honors local community heroes with a Super Hero Award for their outstanding dedication and community service. We appreciate your feedback on our evolving newsletter. Your comments are important to us!